Fukuoka is hot, very hot. You hear people say a place is hot and you have your experience of what hot "feels" like but when it is a new level of hot, you are forced to do whatever necessary to stay "cool." This past month I was stretched. A few days of really hot 90 degree nights is bearable, but day after day gets to be a grind. Without air conditioning only with wet towels and fans did my family and I sweat out the month of July. I was shocked to find out that the exact spot we live in, Fukuoka city-Central Ward was that hottest place in Japan. (famous valley hotspot) Okinawa, and Saitama. Hotter than other places like Bangkok, Thailand, Hawaii, and New Dehli, India! This was an extreme experience I will never forget. Salvation comes in many forms. Ours came in the form of two letters AC! So now I am sleeping, sleeping like a drooling rock! All my kids are...sleeping only a few hours at a time for over a month wore us down, down to our bones. 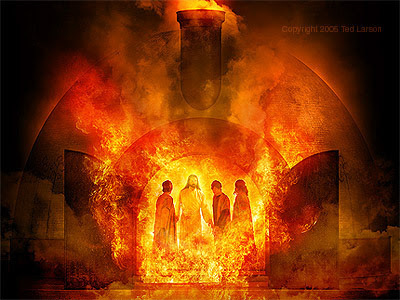 "Beloved, think it not strange concerning the fiery trial which is to try you, as though some strange thing happened unto you"
Trials are not something strange, they are the way we grow and the way others grow. They are the mark of the Christ follower. 6 The night before Herod was going to bring him out to the people, Peter was sleeping between two guards. He was tied with two chains, and there were guards on duty at the prison gate. 7 Suddenly an angel of the Lord stood there, and a light shone in the cell. The angel shook Peter by the shoulder, woke him up, and said, “Hurry! Get up!” At once the chains fell off Peter's hands. 8 Then the angel said, “Tighten your belt and put on your sandals.” Peter did so, and the angel said, “Put your cloak around you and come with me.” 9 Peter followed him out of the prison, not knowing, however, if what the angel was doing was real; he thought he was seeing a vision. 10 They passed by the first guard station and then the second, and came at last to the iron gate that opens into the city. The gate opened for them by itself, and they went out. They walked down a street, and suddenly the angel left Peter. 16 Meanwhile Peter kept on knocking. At last they opened the door, and when they saw him, they were amazed. 17 He motioned with his hand for them to be quiet, and he explained to them how the Lord had brought him out of prison. “Tell this to James and the rest of the believers,” he said; then he left and went somewhere else. When people prayed for Peter and he arrived at their doorstep they were increased in faith. Our trials are not only for us but for those who would pray for us that they may also share in our suffering and revel in our joy when the Lord delivers us. I am learning to take joy in the sufferings in whatever way I can and I do not say that lightly, especially after having bouts of heatstroke and insomnia. The joy is not irrational optimism, but anchored in faith and experience with God. Why do we endure suffering, shame, or hostility of any kind? The JOY, this same joy that Christ owned in His heart. The joy of the lost coming home, the joy depicted in parable after parable in the gospels. Indeed it is a joy that gives holy strength; the joy of the LORD.